This week we were on vacation, and I feel fairly certain that everyone knew what was going on although we probably won't be announcing until after first trimester. I was completely wiped out, so I ended up napping for a couple hours nearly every day when Josie went down for her nap. Josie also slept in until 7:30am just about every day, so we got over an hour extra sleep each night too. I wish I could say that I felt wonderful about all this sleep, but it only upgraded me from slightly delirious to pretty much functional, maybe in part due to the fact that I was sleeping so poorly too. Crazy dreams, waking up in the early hours and then not fully getting back to sleep after that. The days I slept until 5am before waking up for the first time were the highlights. 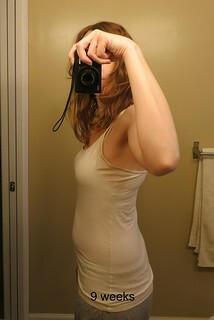 Besides that, the random bouts of nausea continued, and I was cranky and constantly hungry this week. I do feel (and I think look) a bit thicker this week, but I'm pretty sure that's just because I ate more than usual (and not as healthfully either). And yet I only gained a couple of pounds over this week at the lake - usually it's closer to 10 - so maybe it's not entirely a food belly? 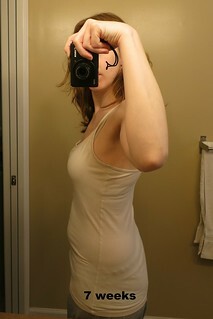 Here's the comparison pictures for this week - again, no 8 week picture because of vacation. We're home now, though, and back to the regularly scheduled programming/picture-taking location :) I'm also blaming my inability to be consistent with the picture fonts on fatigue.